The Index opened flat to negative but saw huge sell-off to the lows of the day around 8340, the responsive buyers took control from thereon to move the index back in green but closed just a bit lower at 8381.10, loss of 16.90 points. The broader market was weak, with 580 advances to 901 declines. The broader range at start of series is at 7900-8700. Call option 8300-9000 added huge 29.36 lacs OI with small short covering seen at 7900 and lower strike prices. Put option 8600-7700 added huge 20.17 lacs OI with small short covering seen at 8800 strike price. Nifty Open Interest is at 1,38,24,350 down by 47,250, with decrease in price, most probably long liquidation. Bank Nifty Open Interest is at 14,62,675 down by 1,52,100, with decrease in price, most probably huge long liquidation. 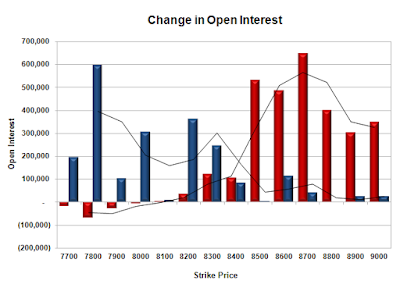 FII’s sold 1.90 lacs Futures, which includes 1795 contracts long liquidation and 5795 contracts short build-up, with increase in net OI by 4000 contracts (includes 42346 longs to 49936 shorts for the day) and the Average Price comes to 8646.82. 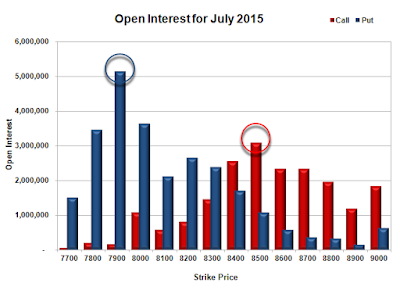 FII’s Index future open contract as on date is 369071 Longs to 121226 Shorts, Net Long 247845 contracts. Initial support at 8300, with OI of 23.89 lacs and below that at 8000 with OI of 36.39 lacs. Initial resistance at 8400, with OI of 25.46 lacs and above that at 8500 with OI of 30.90 lacs. 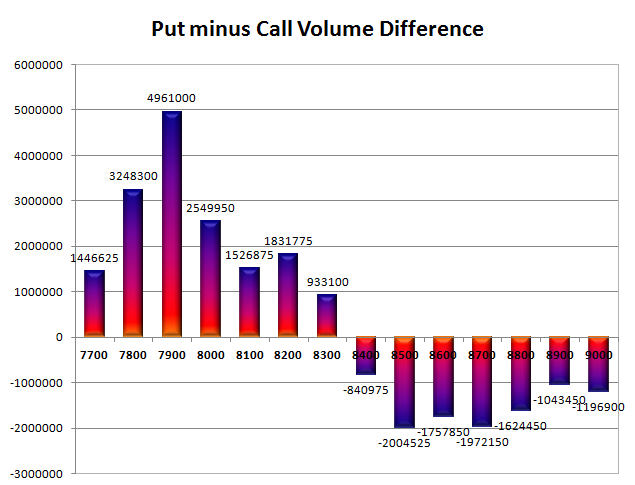 Day Range as per Option Table is 8309 - 8446 and as per VIX is 8312 - 8450 with 8376 as the Pivot.